Fig. 388. 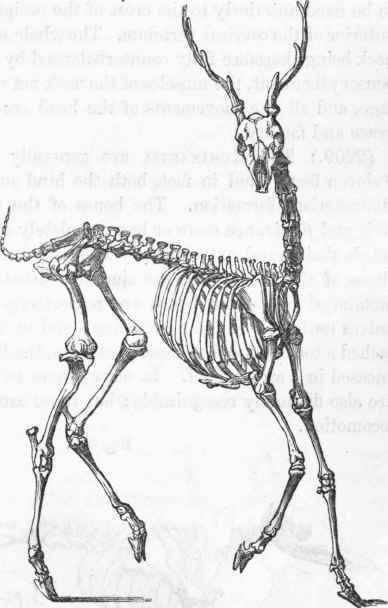 Skeleton of the Stag. (2209). The Rtjmotantia are generally distinguished as having "cloven feet;" and in fact, both the hind and fore feet present a very characteristic formation. The bones of the fore-arms, as well as the tibia and fibula, are more or less completely consolidated, especially towards their distal extremities. The carpal and tarsal bones resemble those of the Horse, and are similarly situated. The metacarpal and metatarsal or cannon bones are respectively composed of two lateral halves united along the mesial line; and to each of these halves is attached a toe composed of three phalanges, the last phalanx of each being encased in a strong hoof. In some genera two rudimentary lateral toes are also distinctly recognizable; but these are too small to be used in locomotion. Fig. 389. Skeleton of Armadillo. (2210). The Edentata, forming the next order of quadrupeds, are so called from the deficiency of teeth observable in the fore part of their mouth. In the most perfect tribes, as, for example, in the Armadillo (fig. 389), the skeleton is well developed in all its parts, and presents nothing to attract our special notice, except, perhaps, the large proportionate size of the distal joints and claws that arm the toes; but in the Sloths (Bradypus) so unusual is the conformation of the limbs, that it had at one time become quite the fashion for naturalists to bestow a passing expression of sympathy in alluding to these so-called miserable and imperfect members of the animal creation. (2211). "The Sloths," says Cuvier*, "derive their name from their excessive slowness, the result of a structure truly heteroclite, where Nature seems to have wished to amuse herself by producing something imperfect and grotesque. These animals have their fingers joined together by the skin, and only indicated externally by enormous compressed and hooked claws, which are bent when in repose towards the palms of the hands or the soles of the feet. The hind feet are articulated obliquely with the leg, and only rest upon their external edge: the phalanges of the fingers are articulated by tight hinge-joints, and the proximal ones become consolidated at a certain age with the bones of the metacarpus or metatarsus; even these last become anchylosed with each other for want of use. To this inconvenience in the organization of the extremities may be added one equally great, consequent upon their proportions: the arms and the fore-arms are much longer than the thighs and the legs; so that, when these creatures walk, they are obliged to drag themselves upon their elbows; their pelvis, too, is so wide, so much inclined laterally, that they cannot approximate their knees. Their deportment is the natural consequence of such disproportionate structure. They remain upon trees, and never quit one till they have stripped it of its leaves, so difficult is it for them to get to another; nay, it is even asserted that they let themselves fall from their branch to avoid the trouble of crawling down". (2212). Well may humanity pause before it ventures to accuse Nature of having "wished to amuse herself by producing something imperfect and grotesque;" and we should not have inflicted upon ourselves the task of quoting so painful a passage, did it not emanate from such a source, and had not ample opportunities of observation shown that the very structure so accurately described by Cuvier is better adapted than any other to the arboreal life for which the Sloth is destined. It is not upon the ground, but in the tree, that this animal must be criticised; and there, as we learn, among its native branches, hanging securely by means of its hooked toes and peculiarly-organized hind legs, it feeds in situations which otherwise would be left unoccupied; or, using its long arms, it swings from bough to bough, with a facility little to be expected from its appearance. (2213). The herbage that covers the plain, or the foliage of the trees, are not, however, the only vegetable materials that have been made available for the support of Mammiferous quadrupeds. The Rodentia are furnished with teeth adapted to gnaw even the wood and the bark, or to crack nuts and other hard fruits, from which they derive nourishment. (2214.) 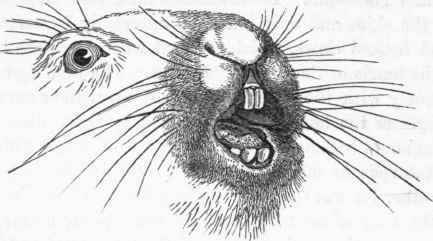 This order of Mammals, therefore, is distinguished by the possession of two incisor teeth in each jaw, so constructed as to erode hard substances, and which, moreover, by a peculiar mechanism, to be described in another place, are always kept sharp and trenchant: such are the incisor teeth of the Beaver or of the Hare (fig. 390). * Regne Animal, vol. l. p. 223 et seq. Fig. 390. Incisor teeth of the Hare. (2215). The skeletons of the Rodentia are slight and feeble, adapted to the bird-like activity of their habits. Their fingers and toes are well developed, and the bones of the leg and fore-arm free throughout their whole length, although the movements of pronation and supination are as yet much limited. In many genera, more especially in such as climb trees like the Squirrels, the clavicles are very perfectly formed, so that the fore legs can be employed to a certain extent as hands, for conveying food to the mouth. (2216). Very generally the hind legs of the Rodentia are considerably longer than their anterior extremities: hence such genera run by bounds or leaps, and their course is extremely rapid. In the Jerboa (Dipus) (fig. 391) this disproportionate size of the hind legs is excessive, insomuch that the creature moves by leaps, like a Kangaroo; and the metatarsal bones of the three middle toes being consolidated into one bone, the whole limb resembles more that of a bird than of a quadruped.